The fourth installment of NMWA’s biennial exhibition series, Organic Matters—Women to Watch 2015 is presented by the museum and participating national and international outreach committees. 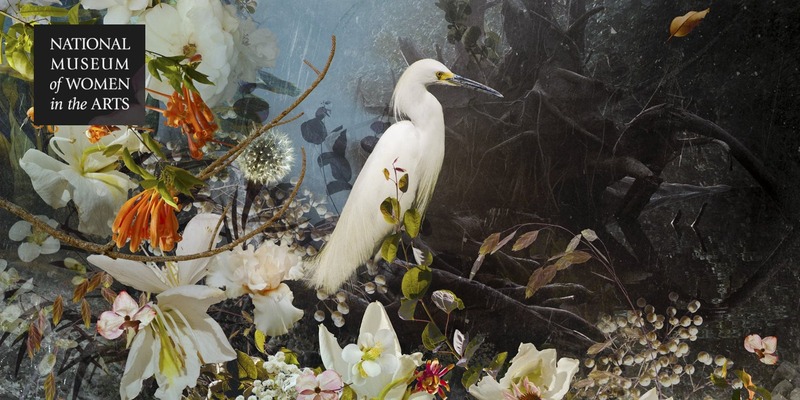 The exhibition’s artists redefine the relationship between women, art, and nature. Associate Curator Virginia Treanor spoke with emerging and contemporary women artists featured in Organic Matters. 1. Organic Matters includes art that refers or responds to the natural world. How do you think your work Reflection relates to the theme of nature? Nature is omnipresent in my work. I strive not only to honor its beauty, grace, and power, but to go further, to explore and learn from nature’s consciousness, its infinite procession of interrelationships. Reflection speaks of the mirror effect that a relationship with another can offer, especially when we are aware and specifically choose certain challenging relationships as opportunities to grow and to awaken to our own beauty and individuality. 2. Is this work representative of your oeuvre? How does it fit into your larger body of work? From a technical perspective, Reflection shares the hypercollage technique I employ throughout my body of work—an enhanced approach to digital collage, in which fragments of original nature photography are woven into tableaus with the cohesion and persuasiveness of classical painting. Thematically, this specific work continues an ongoing story established with Les Naturalistes, a piece I created a few years back. It represents two people who profoundly love each other, but decide to depart from their shared relationship, to grow individually, respecting their own natural rhythms. Observation. I like to say, if you just take the time to relax and observe, you can have access to the gates of creativity. 4. Who or what are your sources of inspiration and/or influence? I am influenced by my personal awakening and the things that trigger the opening of my heart. Nature, art, people . . . .
5. What’s the last exhibition you saw that you had a strong reaction to? I recently visited Armory Week in New York City, and felt that the collective energy emanating from the artists’ works had changed since the last few years. Less shocking, less in-your-face, but more introspective and aesthetically graceful. There is a need, perhaps, to explore again the brighter side of life—a place I have been expressing visually for many years now.